Process of getting SIM card was easy, I got all required instructions via Whats Up. Also they supported me with all questions during my stay in Sri Lanka. Can recommend this service. Travels in Sri Lanka are made so much easier with a high speed internet connection provided by a 4G SIM card that saves you from overspending on roaming charges. Load up maps, translations, and even show photos of where you're going to the locals to help find your way during your travels. A fast internet connection isn't only a life saver; it also allows you to stay connected to family and friends around the world. Share your memories, photographs, and videos as you make your way through Colombo and Sri Lanka. 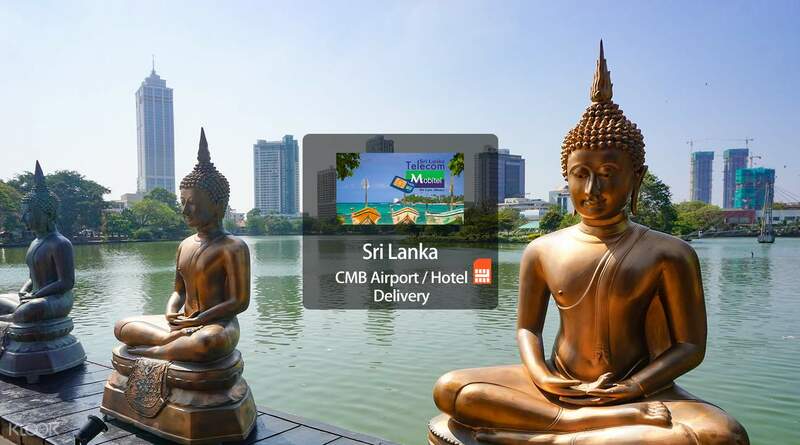 You can pick up your 4G SIM card right at Bandaranaike International Airport in Colombo or have your SIM card delivered right to your Colombo hotel, making things even more convenient. Make your travels throughout Sri Lanka easier with 4G/3G internet speeds from a local SIM card! The representative will wait for you up to 60 minutes from your flight landing time. If you are delayed longer than 60 minutes after landing, please email or message to check if the representative is still available. Very efficient and easy to use. Pickup from airport will see the rep holding up a klook sign so that u dun miss her. Very efficient and easy to use. Pickup from airport will see the rep holding up a klook sign so that u dun miss her. Process of getting SIM card was easy, I got all required instructions via Whats Up. Also they supported me with all questions during my stay in Sri Lanka. Can recommend this service. Process of getting SIM card was easy, I got all required instructions via Whats Up. Also they supported me with all questions during my stay in Sri Lanka. Can recommend this service. The service is very great. I booked the simcards in advanced and had contact by whatsapp about the delivery time. A woman was waiting for us with the Klook sign and gave the simcards to us. The service is very great. I booked the simcards in advanced and had contact by whatsapp about the delivery time. A woman was waiting for us with the Klook sign and gave the simcards to us. It was delivered on time to the hotel. Its already activated and only have to put the sim in. Very easy. Thanks Klook!! It was delivered on time to the hotel. Its already activated and only have to put the sim in. Very easy. Thanks Klook!! The one hour waiting time is not enough as the immigration line was super long (peak season). If you have a guide/driver waiting, they can get the simcard for you provided they have a copy of your passport. Else, you need to arrange a different collection date which is a hassle especially if you’re not staying in Colombo. Maybe, they can open a counter for collection at the airport like in other countries. The one hour waiting time is not enough as the immigration line was super long (peak season). If you have a guide/driver waiting, they can get the simcard for you provided they have a copy of your passport. Else, you need to arrange a different collection date which is a hassle especially if you’re not staying in Colombo. Maybe, they can open a counter for collection at the airport like in other countries. I got a mobitel sim in a brown paper envelope. It didn’t come in the usual brand packing so it took me a lot of time and a msg to provider to figure out my own number! Airport rates and plans were cheaper. Lady waits at taxi pick up exit not at the meeting point inside the terminal. Good side- sim works fine and the providers were available to help. I got a mobitel sim in a brown paper envelope. It didn’t come in the usual brand packing so it took me a lot of time and a msg to provider to figure out my own number! Airport rates and plans were cheaper. Lady waits at taxi pick up exit not at the meeting point inside the terminal. Good side- sim works fine and the providers were available to help. I thought the sim was already set for the internet, turns out that by the time i got the sim i had an internet but it was free data we get when we buy a new one and then I have to load it up again on the same day (after 4hrs), which I don’t have an idea where ended up getting a new one and set the data myself. I thought the sim was already set for the internet, turns out that by the time i got the sim i had an internet but it was free data we get when we buy a new one and then I have to load it up again on the same day (after 4hrs), which I don’t have an idea where ended up getting a new one and set the data myself. Greetings from Klook Travel. We had come across your review regarding 4G SIM Card (CMB Airport/Hotel Delivery) for Sri Lanka and the inconvenience that you have experienced. We have looked into it, and our specialist will get in touch with you shortly to assist you. Thank you! Greetings from Klook Travel. We had come across your review regarding 4G SIM Card (CMB Airport/Hotel Delivery) for Sri Lanka and the inconvenience that you have experienced. We have looked into it, and our specialist will get in touch with you shortly to assist you. Thank you! Worst sim card ever. Says in the description data is for 3.3gb but ours worked for one night and only free data. Had to buy another sim with legit data allocation. This is a scam! don't avail if you don't want to waste your money. just buy sim card at the airport, it's more reliable. Worst sim card ever. Says in the description data is for 3.3gb but ours worked for one night and only free data. Had to buy another sim with legit data allocation. This is a scam! don't avail if you don't want to waste your money. just buy sim card at the airport, it's more reliable. Thank you for raising your concern to us. We sincerely regret to hear that you had unsatisfactory experience and we take your feedback extremely seriously. Please be informed that the information mentioned on Klook website is Data quota: 1.34GB during daytime (9:00am-11:59pm); 1.96GB during late hours (12:00am-8:59am). 3.3GB in total. If you watching the videos with this SIM card, the quota will reach very soon. Your understanding will be much appreciated. Thank you for raising your concern to us. We sincerely regret to hear that you had unsatisfactory experience and we take your feedback extremely seriously. Please be informed that the information mentioned on Klook website is Data quota: 1.34GB during daytime (9:00am-11:59pm); 1.96GB during late hours (12:00am-8:59am). 3.3GB in total. If you watching the videos with this SIM card, the quota will reach very soon. Your understanding will be much appreciated.